As a dentist, many patients come to me at Apple Tree Dental with various stories and circumstances, but recently I had an experience that was simply too exciting not to share. One day, a wonderful patient came to our clinic. As wonderful as she is, she was not thrilled to be sitting down to talk with me about a floppy, poor-fitting denture. She explained to me that it was not just dentists she didn’t like, once during childbirth she had punched a doctor! She was not thrilled to be with any medical professional, and I couldn’t blame her. For years she had gone through multiple dental offices and had unpleasant experiences as well as simply unsatisfying results. 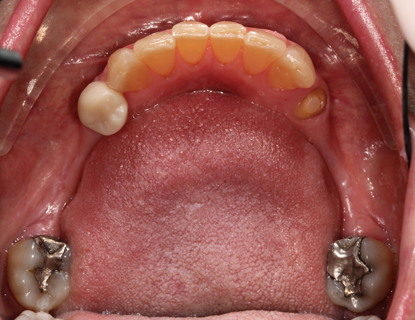 For multiple years she was unable to chew normally since she was missing several teeth on both sides of her mouth. 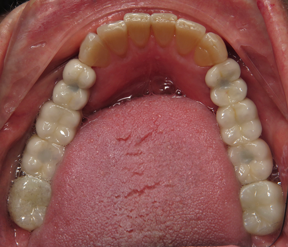 The original solution was a removable partial denture. For those that don’t know what that is, a removable partial denture is a removable set of teeth that sit on a plastic and metal base that snaps in and out of the mouth. Her denture clearly did not bring happiness to her. Having to take something in and out of her mouth was a burden that caused embarrassment and anxiety. Beyond embarrassing, it was hard to take care of the hardware. From my experience with patients, she was not alone in her dislike for dentures. One problem with dentures is how easily they can be lost or damaged, requiring a new one to be made. This is an added cost for something a patient may not even be satisfied with. Dentures can also lead to health and nutrition problems. Since dentures aren’t like real teeth and they are less comfortable to chew with, people will swallow much larger bites of food. Nutrition and digestion just aren’t the same. As I spoke with her, it became more and more obvious that the partial denture was not cutting it. I talked to her about some treatment options, and she expressed interest in dental implants. However, a previous dentist wouldn’t do the procedure because of a complication he discovered within her jaw. There was only a very small space available to place the implants correctly, and an error could cause irreparable damage to our patient. As I looked at her mouth and x-rays, I discovered the previous dentist was right in determining the complexity of the procedure, but I knew that with our technology we could do it. After we had a final consultation of the procedure with our patient, we went straight to work. We first gathered a full 3-dimensional x-ray of her jaw. With this, we could see how the dental implants needed to be placed perfectly. With this information I gathered from the x-ray I created a blueprint for her treatment. 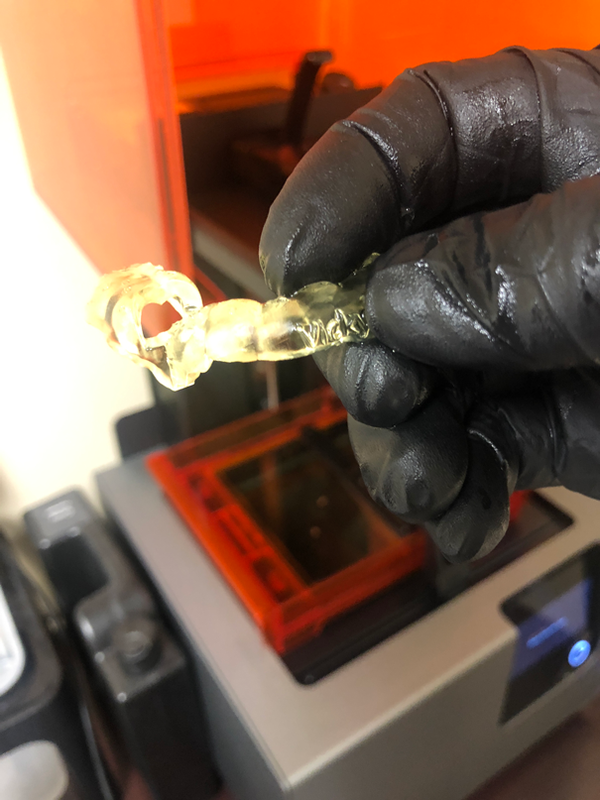 I designed a surgical guide that could be 3D printed. The surgical guide was a critical piece for the procedure because it would allow us to design a customized guide to fit her and allow us to place the dental implants right where they should be. With our 3D printing technology, I was able to print this within our office and make the best possible outcome for her. When the first day came to begin placing the implants, we wanted to make sure this wonderful woman was completely comfortable. Knowing her story - that she did not enjoy her time with medical professionals – I used IV sedation so she wouldn’t have to worry about a thing during the procedure. I went to work and one by one, using the surgical guide, placed the first dental implants into her mouth without a problem. She was so excited to have the first of her new teeth! And all of us here at Apple Tree Dental in Rexburg were just as excited for her, but in the process, she moved to Utah before the procedure was complete. Even with the move to Utah, she entrusted us with the care of her implants, which we were able to do without any problems. Things that to most of us seem so normal, like eating on Thanksgiving, chewing candy, or snacking on popcorn, had previously been a burden for her. Even the sensation of chewing many of us have never even thought about, but when you have lost teeth that feeling can be very different and uncomfortable. Now she can enjoy these simple things that have such a profound impact on our quality of life. It was rewarding seeing the transformation this woman had, from no teeth in the back of her mouth and the literal pain that brought her, to this excited state of joy and happiness she had when everything was said and done. Whatever your dental needs are, I want you to know that Apple Tree Dental in Rexburg is the place for you. We have redefined what it means to go to the dentist by providing outstanding technology combined with 5-star bedside manner to give you the comfort and care you deserve at the dentist. Our team is here to provide you with extraordinary integrity, care, and comfort.